It's goodbye from him and it's goodbye from me. Jurgen Klopp and his players will probably be watching Match of the Day on the team bus back to Liverpool - I suggest you tune in too. It's on at 22:20 BST. BBC One or online. Don't miss it. Crystal Palace manager Alan Pardew speaking to BBC Sport: "The first half was difficult on the sideline. We talked about putting them under pressure but in the first period we did not start well. "We worked hard and defended well but we should have put more pressure on Liverpool. But they are a good team. Two set plays though, that is not us. "We have to tighten up on that area. Our centre-backs are good but they got done today. It is something we have to work on. "In the second half, the game hinged on key moments. There were some penalty decisions which I thought were tight. We had a tight one last season with the same referee." Martin McNamara: So CPFC concede four goals at home and Pards complains about the ref? Mate you have far bigger problems to focus on. Tim Smith: Keep calm and carry on. We are in good form and Klopp has the experience that Rogers lacked. He said believe. I'm believing. Crystal Palace's James McArthur speaking to BT Sport: "It's a disappointing result. Probably a good game for the neutral. We are very disappointed with ourselves conceding four goals at home. "We tried to get up the pitch more in the second half and put them under pressure. In the first half we retreated a bit too much." Crystal Palace manager Alan Pardew talking to BT Sport: "I don't think Andre Marriner should have reffed today. He gave the penalty last year and I don't know why Mike Riley gave the game to him again. It is a bit frustrating. "Why create pressure on him and us because of last year's decision? Our fans were giving him stick from the start." Are you getting worried yet Palace fans? That's three defeats on the spin for your boys, leaving you down in 12th and only four points above the bottom three. 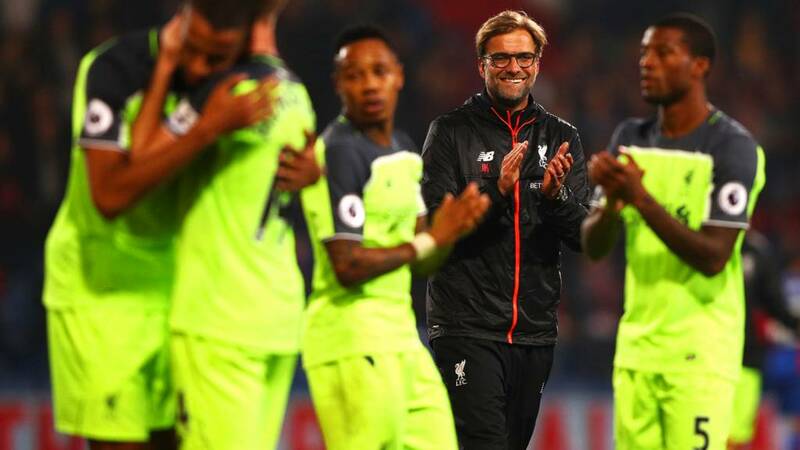 So Jurgen Klopp is a happy man. Alan Pardew isn't. He's moaning in his post-match interviews about Andre Marriner being chosen to referee the match. You might remember Marriner awarded a late penalty against Palace in the same fixture last season, which Christian Benteke tucked in to clinch a 2-1 away victory. Liverpool manager Jurgen Klopp speaking to BT Sport: "In the first 15 minutes we were not really at 100% then in half an hour we created chance after chance. It was a close game and a deserved win at the end. I'm a very happy man. "The defensive error we made for the first goal is because we are not at the limit of our concentration. The aggressiveness was not there at the start of the game. But I saw a lot of wonderful things today offensively." On defenders Dejan Lovren and Joel Matip scoring: "We work so long on it and today finally we did it. It was a world class cross from Philippe Coutinho. "In the second half, Palace did really well. In the first half both goals were kind of a present from us. It was difficult but, in the end, deserved and it feels good." I don't know if Match of the Day will have time to show you all the incidents from that first half, but don't miss it! Liverpool defender Dejan Lovren talking to BT Sport: "It was better to clear the ball then try to play (for the Palace opening goal) but I kept my head up and the work paid off. "All together it was a deserved win and we could have scored more goals. "They are dangerous from set-pieces but we have been brilliant today." Liverpool midfielder Jordan Henderson speaking to BT Sport: "It''s a difficult place to come. It was a battle throughout game but, in the second half, we managed the game well. Then we managed to finish the game off and, overall, we are delighted. "We need to look back at the game and at the mistakes, but we forgot about that and moved on. "I've said before we just need to concentrate on our game. We are not getting ahead of ourselves and taking it game by game." Cracking game. I think Liverpool can win the league. They’re just a goalkeeper and a central defender from doing it. How you feeling after that then Liverpool fans? Six wins in seven unbeaten Premier League matches, just a couple of goals off top spot. But we saw both sides of your team today - scintillating attacking play and porous defending. The Liverpool players march over to the travelling fans en masse, thanking them for their support. And the thanks is reciprocated for a good evening's entertainment. Worth every penny.